“Pep Rally” will soundtrack an Amazon ad during Super Bowl 50, on the one-year anniversary of Elliott’s halftime performance. 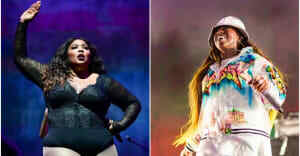 After coming back in a big way late last year with "WTF," her collaboration with Pharrell, Missy Elliott shares another new song. "Pep Rally" has all the catchiness and anthemic qualities of a classic Missy track, and features a Super Bowl-referencing verse. A seemingly unauthorized YouTube upload of the song, not posted to Elliott's official page, circulated online Sunday morning. On Sunday afternoon, the song was available for streaming on Spotify and purchase on iTunes. "Pep Rally" is also set to make an appearance during Sunday night's big Super Bowl 50 broadcast, where it will play prominently during an advertisement for Amazon's Echo device, which can be seen above.